World War II created a countless number of stories of heroism, sorrow, courage, and intrigue, many of which will never be known save for just a few. The “The Detroit Free Press” of May 17, 1945 reported one such event which would surprise many historians today. 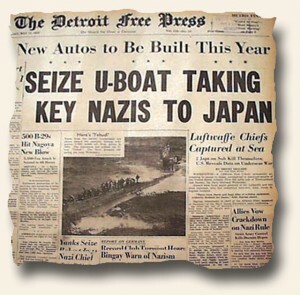 Its headline notes: “Seize U-Boat Taking Key Nazis To Japan” with a subhead: “Luftwaffe Chiefs Captured at Sea“. This was just 10 days after the surrender of Germany, and less than 3 months before Japan would surrender to end World War II. The related article mentions in part: “A 1,600 ton Nazi U-boat, presumably attempting to escape to Japan, surrendered to destroyer-escorts of the U.S. Atlantic Fleet…Aboard were 3 major general of the Luftwaffe and two dead Japanese, who had committed hara-kiri…”. 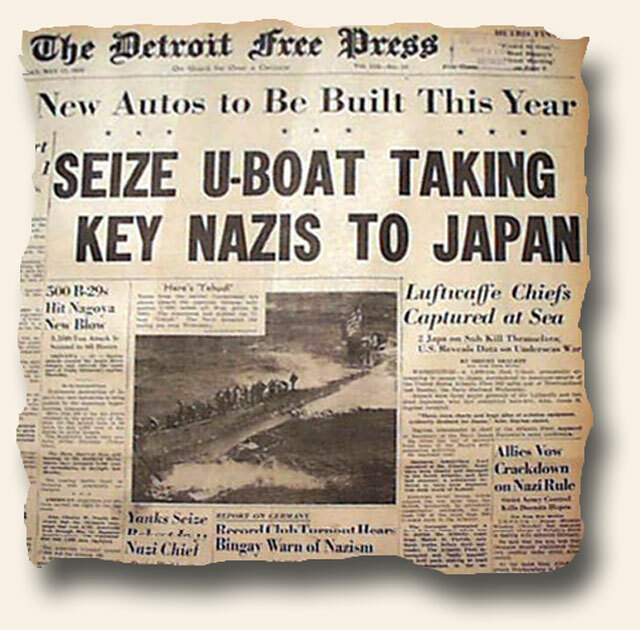 To this day few know of the attempt of Nazi generals to seek refuge in Japan, yet it was a front page headline in Detroit at the time. Ironically, the photo shown is actually of the capture/surrender of the infamous U-505, an event which had occurred in June of 1944, but was not announced/released until the previous day. A movie in the making? The put it in print… Killing them with kindness?